Using Tudor Place media from CyArk to explore architecture in 18th century America. With the United States days away from a historic inauguration, teachers can use this current event as an opportunity to highlight American history in the classroom. Teachers can take their students on a virtual field trip to Washington DC-no permission slips required! The CyArk website features 3-D data, videos, panoramas and photographs from Tudor Place, a home owned by George Washington's granddaughter. The house is an excellent example of the Federal period architecture that was popular during the early history of the US and can be used to show students how the Founding Fathers of the US lived. Tudor Place is located in the historic Georgetown Heights district of Washington, D.C. on an expansive site of five and a half acres of landscaped gardens overlooking the Potomac River. The mansion was built by Thomas Peter and Martha Custis, George Washington's granddaughter, and was the Peter's family home for six generations. 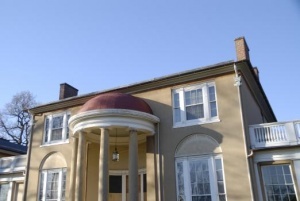 Built between 1795 and 1816, Tudor Place was designed by Dr. William Thornton, who also designed the United States Capitol. The architectural style of the Tudor House is reflective of the philosophies and ideals of the time and can be used to help students consider the changes undergoing the US at the end of the 18th century. Have student begin looking at exterior photographs of Tudor Place. What do they notice about the building? How would they describe the appearance of the building and its architecture? In front of Tudor place there are several columns. These columns are common in Neoclassical buildings. Ask students if they have seen any other buildings with similar columns in any other countries and time periods. Similar columns were often used in classic Greek and Roman architecture. These cultures embodied the democratic principles that were so important to the newly formed United States and is reflected many US Neoclassical buildings, such as Tudor Place. Some students might also note that the Neoclassical exterior of the house is symmetrical and has simple and clean lines, especially when compared to the the ornate, baroque styles that were associated with the English royal monarchy. This elegant style can also be seen in the US Capitol building, a building designed by William Thornton, the architect of Tudor Place. Both the Capitol building and Tudor Place embody the Neoclassical architecture favored by the Founding Fathers. Ask students to look at photos of Tudor Place and the Capitol building. What words might be used to describe Tudor Place and the Capitol? Ask students to write down 3 words to describe the style of Tudor Place and the Capitol building. President Washington described Thornton's winning design for the US capitol building as "Grandeur, Simplicity, and Beauty" when it was submitted for review. 3-D laser scan data of Tudor Place is also available on the CyArk website. Students can hypothesize whether Tudor Place's exterior is symmetrical and then test their hypothesis by using the measuring tool in the CyArk 3-D viewer to measure the front of the building. Students can also explore the interiors Tudor Place through a number of immersive panoramas. 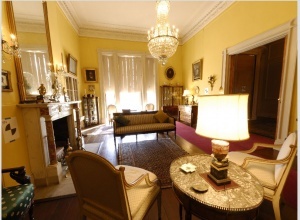 Many of the interiors have been maintained of the period and contain a many artifacts which belonged to George and Martha Washington themselves. Have students observe the furniture, china, silver, and paintings in the rooms. Tudor Place has both a Drawing Room and a Parlour, a common floor layout in many Federal homes. Have students looks at the panoramas of the Parlour and the Drawing Room. For each of the rooms, ask students to observe the furnishings and to make inferences as to what the function of the rooms might have been. Which of the rooms appears to be more formal? The Parlour was less formal than the Drawing Room and was used as both a parlor and a dining room through the late-19th century. The Drawing Room was the more formal of the two parlors. It was the scene of many formal entertainments, such as a reception for the Marquis de Lafayette in 1824. For teachers who are interested in incorporating a math activity in their study of Tudor Place, the CyArk website has a detailed lesson plan on studying scale using Tudor Place as an example. In this activity, titled "Mapping and Measuring with Google Maps," students use scale and aerial photos of Tudor Place to determine the size of the building. Students then compare their answers derived from the scale activity to measurements they make with the 3-D laser scan model of Tudor Place. We hope that you will be able to explore Tudor Place as part of your classroom studies of American history! Tudor Place is an example of <a href="http://archive.cyark.org/southern-facade-center-block-tudor-place-media">Federal style architecture</a>, which was very popular during the late 18th centurty in the US. 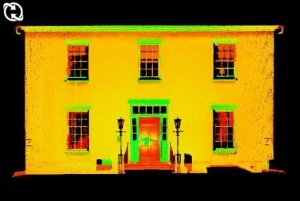 <a href="http://archive.cyark.org/3d-point-cloud-of-tudor-houses-eastern-facade-media">3-D laser scan data</a> of Tudor Place can be used by students to determine if the building is symetical. Students can examine <a href="http://archive.cyark.org/panorama-of-drawing-room-tudor-place-media>panoramas</a> of a rooms at Tudor Place and learn more about their function.